Do you have BC’s ugliest chair? It might win you a brand new La-Z-Boy! La-Z-Boy Rowan Reclina-Rocker® Recliner chair, valued at $1199. Transitioning into the world of motion sofas, the La-Z-Boy Rowan is based on the success of its clean, contemporarily styled recliner predecessor. Its powered-up comfort brings its bucket-seat styling and inviting chaise seat to another level for consumers looking for ultimate comfort while not sacrificing look. Facebook, Twitter or Instagram with #UgliestChairBC. Don’t wait to post, the contest only runs until February 28th! 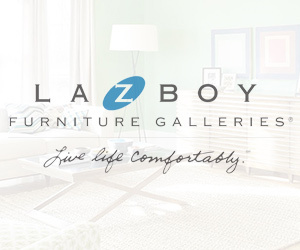 Every week, La-Z-Boy will give out a $100 La-Z-Boy Gift Card to one of the lucky contestants along with an entry into the ugliest chair contest!